Mary Blairz: "The Heart of the Oak"
There's an animation studio in Spain, Milimetros, working on a CG family fantasy feature based on European myths and fairy tales. 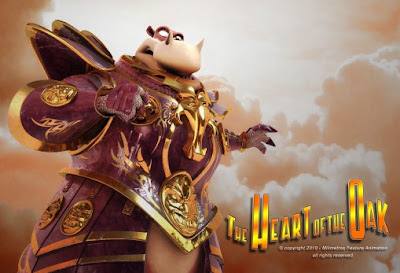 The film is called "The Heart of the Oak" and is scheduled to be released around mid-2012. “The Heart of the Oak” is an epic story brought to life with humor and romance. It is inspired in the European mythological traditions, its legends, to create a magical universe full of beauty, a world close to children. But it is also the reflection of our own universe, a story of daily situations with the family. Strange events are changing the climate in Dragon Hill and this sudden freeze has plunged it into darkness. On top of Dragon Hill, there is an oak tree as big as a mountain and as old as time. Its heart has always protected the balance of the environment but now it is dying. Robin, the little Elf and guardian of the forest, implores the Gods to help him fight this menacing evil that threatens to destroy all life. When he finally receives help – it is not what he expected. You can read more about the film and production HERE.